[*] SPICER: Good afternoon, everyone. Thanks for coming out to our first official briefing here in the Brady Room. I was going to start with a recap of the inauguration, but I think we’ve covered that pretty well. By the way, just as I get started, I know that Josh Earnest was voted the most popular press secretary by the Press Corps, so after reading -- checking my Twitter feed, I shot Josh an e-mail last night letting him know that he can rest easy, that his title is secure for at least the next few days. Let me begin by saying that the president has been closely monitoring the severe weather in the southeast. He spoke by phone with Governor Deal of Georgia yesterday and offered his condolences and support. Today, President Trump is focused on fulfilling his pledge to pursue trade policies that put America first. SPICER: The president began his day with a breakfast with key U.S. business leaders where the focus of the discussion was on job creation and growing our manufacturing base. Business leaders who attended included Michael Dell, founder and CEO of Dell; Jeff Fettig, the CEO of Whirlpool; Mark Fields, the CEO of Ford; Alex Gorsky, the CEO of and Johnson and Johnson; Marillyn Hewson, the CEO of Lockheed Martin; Klaus Kleinfeld, the CEO of Arconic; Andrew Liveris, the CEO of Dow; Maro Longi, the CEO of U.S. Steel; Elon Musk of SpaceX and Tesla; Kevin Plank of Under Armour; Mark Sutton of International Paper; Wendell Weeks, the CEO of Corning; Chief of Staff Reince Priebus; Chief Strategist Steve Bannon; the vice president’s chief of staff, Josh Pitcock; and senior adviser Steven Miller. The breakfast was an opportunity for the president to hear directly from America’s top business leaders about the challenges they’re facing and take some suggestions about what policies and action can be taken to help them create jobs and grow our manufacturing base. The meeting included a really great exchange of ideas and the president has decided to reconvene the group in a month and then have them meet on a quarterly basis. As you know, the president’s vision is to negotiate fair trade deals that create jobs, increase American wages and reduce America’s trade deficit. He’s appointed a tough and smart number of trade experts who will fight on behalf of American workers. With that vision in mind, the president has already taken several steps today. First, he issued a presidential memorandum withdrawing the United States from the Trans-Pacific Partnership. TPP is a multilateral agreement that includes the United States and 11 other countries. As the president has said many times, this type of multinational agreement is not in our best interest and he’s moving quickly to advance trade policies that increase the competitiveness of the American worker and manufacturer. This executive action ushers in a new era of U.S. trade policy in which the Trump administration will pursue bilateral trade opportunities with allies around the globe. This is a strong signal that the Trump administration wants free and fair trade throughout the world. Additionally, the president issued a memorandum reestablishing the Mexico City policy, stating that the United States will end the use of taxpayer dollars to fund abortions overseas along with coercive abortion and sterilization practices. Finally, the president issued a memorandum outlining executive branch hiring. This memorandum counters through dramatic expansion of the federal workforce in recent years. In particular, it prevents filling vacant positions and creating new positions except when necessary to meet national or public security responsibilities. It does not apply to military personnel and it ensures that the American taxpayers get effective and efficient government. Earlier in the day, the president spoke with Egyptian President el-Sisi. They discussed ways to deepen the bilateral relationship and support Egypt’s fight against terrorists and bolster Egypt’s home- grown historic economic reform program. President Trump underscored the United States remains strongly committed to the bilateral relationship, which has helped both countries overcome challenges in the region for decades. The president committed to working -- continuing to (inaudible) military assistance to Egypt and working with Egypt to ensure that assistance most effectively supports the Egyptian military’s fight against terrorism. The president also commended President el-Sisi for his courageous steps to address Egypt’s economic challenges and offered to discuss ways the United States could support Egypt’s economic reform program. Finally, the two leaders discussed a visit to the United States in the future. The president then had lunch with the vice president, where they recapped this morning’s meetings and discussed next steps. They also had discussed plans to advance the president’s legislative agenda to make America safer and more prosperous. Also today, the president signed (ph) designations for acting heads of executive departments and agencies to maintain continuity in those critical positions. SPICER: At three o’clock, union leaders and front line workers will meet with the president to discuss his pro-worker agenda. Attendees include Tom Flynn of the United Brotherhood of Carpenters; Sean McGarvey, president of the North American Building and Construction Trades Department; Terry O’Sullivan, general president of the Laborers; International Union of America -- of North America; Mark McManus, the general president of United Association; Donald Mullins (ph), Steamfitters United Association Local 602; Frank Spencer, United Brotherhood of Carpenters; Doug McCarron, general president, United Brotherhood of Carpenters; Mark Coles of Ironworkers Local 5; Joseph Sellers Junior, the general president of the Sheet Metal Workers Union/SMART Union; Thelma M. Matta (ph), the Heat and Frost Insulators and Allied Workers (ph) Local 24; Mark Urkowski (ph), United Association Local 5; Steven Dodd, the Sheet Metal Workers Union/SMART Union, Gary Macino (ph) the Sheet Metal Worker’s Union Smart Union. The President has been honored to received tremendous support from union working men and women on election day and he’s dedicated to growing and deepening their support. And he made it a priority to meet with these union workers on our working day one, here in the White House. The off shoring or American jobs and lack of economic growth in recent years, has hit American workers particularly hard. And the President’s top priority is to retain and attract American jobs, which have already seen happening through his actions on carrier, Sprint, General Motors and so many more. At 5:00 the President will host a bicameral (ph) bi partisan meeting with leaders here at the White House, will include the Vice President, the Senate Majority leader, the Senate Majority Whip, the Senate Minority leader, the Senate Minority Whip, the House Speaker, the House Majority leader, the House Democratic leader, the House Democratic Whip, the White House Chief of Staff, our Chief Strategist, Chief of Staff to the Vice President, and Chiefs of Staff from those respective offices. The purpose of the meeting is to get the President’s agenda moving through congress. The American people are frustrated with the lack of progress here in Washington and the President wants no delay in addressing our most pressing issues. He’s taking every step -- opportunity to forge strong bonds with congressional leaders on both sides of the aisle. One of the other subjects that’s sure to come up is the status of his nominees during this meeting. It’s important to note that at this point in 2009, President Obama had seven of his nominee’s confirmed on day one and five more in the first week. As it stands today, we have two. Democrats even held up the confirmation of CIA director Mike Pompeo, needlessly leaving one of our most important national security agencies without its top leader on day one. It’s time for Senate Democrats to stop playing political games with the core functions of government and to allow President Trump’s unquestionably qualified and talented group of cabinet nominees to get to work on behalf of the American people. Rounding out today’s schedule, after the reception that I mentioned, he will have dinner with -- oh we have a meeting with the House Speaker Paul Ryan. They will discuss the Republican legislative agenda and strategy going forward. Early in the day the President nominated former New Mexico, congress woman Heather Wilson as the next Secretary of the Air Force. She grew up in Key New Hampshire and made history as part of the third U.S. Air Force academy class that included women. She earned her master’s degree and Doctoral degrees as a Rhode’s Scholar at Oxford in England and then served as an Air Force officer in Europe during the cold war and on the national security office under President George H W Bush. As you know we’re all about big viewerships and large audiences here. So I want to tell you about an effort that we’re undertaking here in the press briefing room to offer up more access to a group of journalists from around the country. Beginning later this week, I’m excited to announce that we’re going to have four -- what we call skype seats, live here in the briefing room. This will open up the briefing to journalist’s who live beyond 50 miles of the Washington D.C. area and to organizations that don’t currently have a hard pass. As always any organization iis welcome to apply for a day pass. But we’re excited to open up into the field and fold here, a diverse group of journalists from around the country, who may not have the convenience or funding to travel to Washington. I think this can benefit us all by giving a platform to voices that are not necessarily based here in the belt way. Looking ahead, the president will have a breakfast tomorrow with the auto industry, including heads of GM, Chrysler and Ford. He looks forward to hearing their ideas, on how we can work together to bring more jobs back to this industry in particular. On Wednesday the President will host a swearing in ceremony from new Secretary of Homeland security, General James Kelly -- John Kelly. And then on Friday he will do the same for Secretary Mattis at the Department of Defense. On Thursday he will travel to Philadelphia to attend the Republican House and Senate retreat. And on Friday he will welcome his first foreign head of state, British Prime Minister, May. With that I look forward to taking your questions. Daniel Halpern, New York Post? QUESTION: Thank you. When will the -- when will you guys commence the building of the border wall? QUESTION: When will you start the building of the border wall? SPICER: I think that the President has noted that this was a serious priority of his throughout the campaign. He has already started to work with congress on the Appropriations avenue of that. And so he is doing everything he can to direct agencies and congress to commence with that work as soon as possible. QUESTION: What about with Obama Care, are you guys enforcing the mandate or not? SPICER: I think -- look the President has made it clear that he’s going to work with congress to -- and part of the discussion that he’s going to have tonight with some of these leaders, and then again with Paul Ryan, is how we can work to implement the -- both the repeal and the replace aspects of this. QUESTION: Of all the policy, or actions that a President could have taken today, he chose to reinstate the (inaudible) policy. What message is sending here? Does he see the elimination reduction of abortions as an American value? And also here at home, can full (ph) life American’s expect him to put his signature that will defund planned parenthood. SPICER: Well I think the president, it’s no secret, has made himself-made it very clear that he’s a pro-life president. He wants to stand up for all American’s including the unborn and I think the reinstatement of this policy is not just something that echoes that value but respects tax payer funding as well. And ensure that we’re standing up, not just for life, for life of the unborn but also for tax payer funds that are being spent overseas to perform an action that is contrary to the values of this president . And I think continue to further illustrate, not just to the folks here in this country, but around the world what a value we place on life. Jennifer Rodriguez (ph). SPICER: Janet (ph). I’m sorry. QUESTION: Thank you. What did Mr. (ph) Curtis (ph) mean when he said that he would work through Congress to get special something - we don’t what it is (inaudible) recipients? And when can we expect that to happen? And also when can we expect the White House Spanish site to be back up? SPICER: OK. Two questions. Let me start with the latter first. As you know, we hit the ground running on day one. There was a lot to do and we had done a lot of work on the website to make sure that we were prepared to get as much information up as fast as possible. We are continuing to build out the website, both in the issue areas and then that area. But we’ve got the I.T. folks working overtime right to continue to get all of that up to speed. And trust me, it’s just going to take a little bit more time, but we’re working piece by piece to get that done. On the DACA piece. I think the president has been clear that he was going to prioritize the areas of dealing with the immigration system, both building the wall and making sure that we address people who are in this country illegally. First and foremost, the president’s been very, very clear. That we need to direct agencies to focus on those who are in this country illegally and have a record - a criminal record or oppose a threat to the American people. That’s where the priorities going to be and then we’re going to continue to work through the entire number of folks that are here illegally. But right now the clear focus is on that. QUESTION: Hey Sean, I want to ask you two questions money (ph) related. The president campaigned on a corporate tax cut rate of 15 percent and today when he met with the business leaders, he had mentioned that the tax rate would drop to somewhere between 15 to 20 percent. Is he moving the goalpost there in anyway? And my second question is on government spending, there have been reports that you might be looking at $10 trillion over the course of 10 years. Is that accurate? And would you be willing to wrap up entitlements to get there? SPICER: Well I think first, well I’ll take the other one first on entitlements - or on spending. Look, I think you saw this with the hiring freeze. There’s been frankly, to some degree, a lack of respect for tax payer dollars in this town for a long time and I think what the presidents showing through the hiring freeze, first and foremost today, is that we’ve got to respect the American tax payer. They’re sending us a ton of money, they’re working real hard. Some people are working two, three jobs just to get by. And to see money get wasted in Washington on a job that is duplicative is insulting to the hard work that they do to pay their taxes. And I think that that comes into your question, in overall spending as well. We’ve got to look at how we’re spending the American people’s tax money. And so what the work that the landing teams have been doing is going into these agencies and departments and talking about way that we can create greater efficiencies, eliminate duplicity and find - maximize the tax dollar. So it’s more a question instead (ph) of (ph) just cutting, it’s about how do we spend and respect the American tax payer dollar more than - more - more going forward. QUESTION: Fifteen to 20 percent? Sorry (ph). SPICER: Oh, I’m sorry. Look, the presidents a very successful businessman and negotiator. He’s going to sit down and work with Congress to get the best deal possible for American businesses so that they can hire more people and we expend - and we can grow the economy. So he’s going to work with Congress on that rate but he understand better than anybody how to negotiate a great deal. And right now he’s going to negotiate the best deal on behalf of the American worker and on behalf of the American businesses that are hiring them. That was a lot of the focus that went on today, talking to these companies. And it was interesting, the meeting was only supposed to last an hour, it overflowed another hour in the Oval Office and he kept asking them what ideas do you have to grow this economy? What is preventing you from hiring people? SPICER: What regulations are stopping you from conducting more business? What are the ways that we can give you more market access into other countries around the globe? And I think that’s what his focus is going to continue to be, is how do we create a tax and regulatory environment that grows the economy and benefits the American working? So it’s not just about creating more jobs but it’s also about lifting up those job through higher wages. QUESTION: Sean, I have a couple of questions if you’ll allow me to take them one at a time. QUESTION: Elijah Cummings, Maryland congressman -- Democratic Maryland congressman, confirmed that President Donald Trump talked to him at the luncheon about the high price of prescription drugs. When is this meaning and -- going to be set or is it coming up soon? And will the president be meeting with the full body of the Congressional Black Caucus as well as the Hispanic Caucus on issues related to those communities? SPICER: OK. Let’s take them one at a time. I am not -- I’m not aware of that conversation. I’m sure you’ve heard the president the last few weeks talk about the price of pharmaceutical drugs, and the need to get those prices down and bring manufacturing back in the pharmaceutical industry to benefit the country. So it’s an issue that’s gonna -- he’s gonna continue to work on. He understands as we reform health care, as we repeal and replace Obamacare, that getting a hold of the cost of prescription drugs, to give more people access to them, but also to allow greater access in health care -- greater plans in health care, that’s going to be key part of it. So, he’s gonna -- I mean, that’s gonna happen. I think, look, you’re seeing with respect to the other meetings, it’s day one -- working day one here. He’s gonna start with the leadership. He’s gonna have a great conversation with them. But then I think you’re gonna see a variety of meetings: the Congressional Black Caucus, the Hispanic Caucus, small groups of leaders (ph). He is -- you know, he’s someone who really enjoys that kind of conversation. I think you’re gonna see a lot of meetings occur like the ones that you did today, the business leaders coming in, these union workers. And I think that you’re gonna to see a lot more of that, a listening president who’s engaged in trying to figure out what policies and actions that he can take, that this government can take, that he can work with Congress to make people’s lives better, to make their -- their security better, to make their economic security better. But you’re gonna see a lot of that. That’s who he is. That’s what he did during the transition. And I think that’s he’s gonna do going forward. He appreciates the ideas and opinions that come -- that come through the Oval Office or small groups, where he gets to share their prospective and their ideas and their opinions. I think that’s what he’s gonna continue to do later this afternoon. I want to go back to what the gentleman said about the mandate -- the (inaudible). He said something about the Obamacare (inaudible) in the mandate. With the numbers that we talked about and the new news (ph) from the Inauguration Day and the numbers (ph) Saturday, do you believe that you have a mandate to be able to force through what you had talked about, replacing portions of Obamacare, that really subsidized a whole piece of it to help low-income people get health care? SPICER: Well, I think what we have is a -- is a mandate to make health care more accessible and lower costs. That’s what the American people were promised under Obamacare. And I think it’s not a question about a mandate and it’s also not about forcing anything, it’s about what’s doing the right thing. It’s about providing people what they’ve been promised. Which is, you -- you go around this country and you look market after market, they’re down to one plan. That’s not what the American people were promised. Not only that, but in many cases you’re seeing these -- the rates go up 10, 15, 20, 30, 50 percent. That’s not what they were promised either. And so what I think the president’s doing -- and it’s not just -- I think he’s gotten bipartisan support for this. To work with Congress and to take executive action where necessary, to implement a healthcare system that provides more people heathcare, truly allows them to keep the doctor and plan that they’re signing up for, lowers cost, creates more competition. So, do I think he has a mandate? Sure. But it’s not just -- it’s not about -- it’s not on this issue, I think that all leaders have a mandate for the American people, to fix this system and make it better. I’ve got two foreign policy topics I want to get to. There’s some discrepancy between what goes up (inaudible) and what the Pentagon is saying in terms of some potential (inaudible) action. Can you clarify that? And generally, is the president open to joint action in Syria with the Russians? QUESTION: (inaudible) doing joint military actions with Russia in Syria. SPICER: I -- I think if there’s a way that we can combat ISIS with any country, whether it’s Russia or anyone else, and we have a shared national interest in that, sure we’ll take it. QUESTION: And then the second thing is (inaudible) the CIA, on Saturday he was talking about the U.S. not taking oil during the Iraq war. And said that there could be in another pinch for that. What does he mean when he said that? SPICER: Well, I think what the president seemed very clear about in foreign policy is too often the United States is going in with a lot of money, a lot of man power, and in many cases, losing both, loss of life -- and we want to make sure that our interests are protected. And so if we’re going in to a country for a cause, I think that he wants to make sure that America’s getting something out of it for the commitment and the sacrifice that we’re making. SPICER: No, I think that he’s been very clear throughout the campaign that he is committed to making sure that the American people, the American tax payer, see some benefit, and ensure that our interests overseas are not just (inaudible) sending blank checks. That we’re doing something that either protects America or is in our economic interest. QUESTION: A couple things if I could. Later this week, in his executive actions, does the president plan to take action to green light the Keystone XL and Dakota Access Pipelines? And on TPP, Joe McCain says it was a serious mistake to do what the president did for America’s economy and for our strategic position in the Asia- Pacific. Why was TPP the right thing to do? QUESTION: -- the right thing to do, to repeal TPP? SPICER: Oh, I think I said it, because I think the multi -- when you enter into these multinational agreements, you’re allowing any country, no matter the size -- any one of those 12, including us, to basically have the same stature as the United States in the agreement. So we’re basically on par with some very small companies who are getting access to an amazing market, the United States. And in return, we’re negotiating at the lowest common denominator. And I think that when you look at big multinational agreements -- multilateral agreements -- they’re not always in the best interest of the United States. The beautiful thing about a bilateral agreement is that if any one of the true parties in the agreement decides at any time they want to get out of the agreement, or they’re not being treated fairly, they can renegotiate much easier. In a multinational agreement, that’s not the case. In many cases, all of the other countries have to agree to an action or to let somebody out. That’s not putting the U.S. interest’s first. QUESTION: (Inaudible) -- question about Keystone and the Dakota Access? 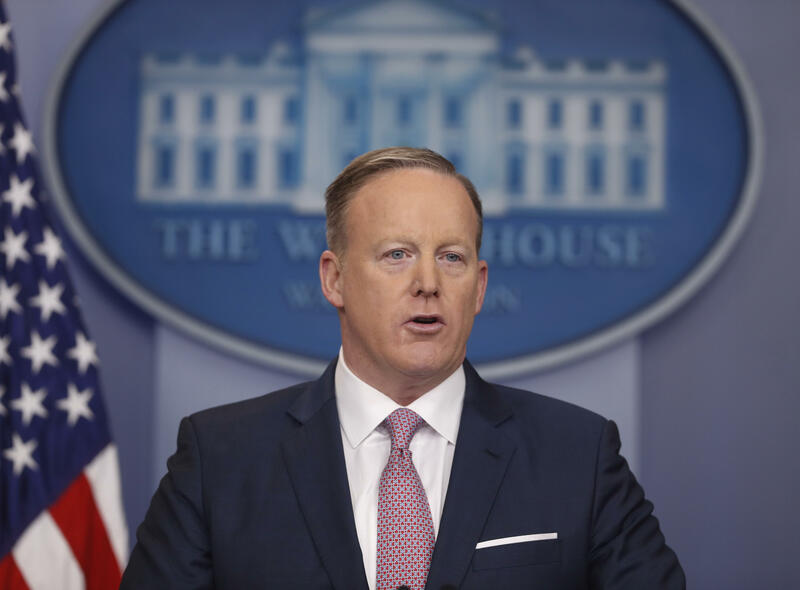 SPICER: I’m not gonna get in front of the president’s executive actions, but I will tell you that areas like Dakota and the Keystone Pipeline, areas that we can increase jobs, increase economic growth, and tap into America’s energy supply more, that’s something that he has been very clear about. I think he talked about it, not only on the campaign, but around the Thanksgiving period. He was talking about that being a big priority. That’s one of those ones where I think that the energy sector and our natural resources are an area where I think the president is very, very keen on making sure that we maximize our use of natural resources to America’s benefit. It’s good for economic growth, it’s good for jobs, and it’s good for American energy. QUESTION: Thanks for being here at (inaudible), it’s great to see you. QUESTION: Before I get to a policy question, just a question about the nature of your job. QUESTION: Is it your intention to always tell the truth from that podium, and will you pledge never to knowingly something that is not factual? SPICER: It is. It’s an honor to do this, and yes. I believe that we have to be honest with the American people. I think sometimes we can disagree with the facts. There are certain things that we may not fully understand when we come out. But our intention’s never to lie to you, Jonathan. Our job is to make sure that sometimes -- and you’re in the same boat -- there are times when you guys tweet something out or write a story, and you publish a correction. That doesn’t mean that you were trying to deceive readers and the American people, does it? And I think we should be afforded the same opportunity. There are times when we believe something to be true, or we get something from an agency, or we act in haste because the information available wasn’t complete, but our desire to communicate with the American people and make sure that you have the most complete story at the time. And so we do it. But again, I think that when you look net-net, we’re going (ph) to do our best every time we can. I’m going to come out here and tell you the facts as I know them. And if we make a mistake, we’ll do our best to correct it. But I don’t -- I think that as I mentioned the other day, it is a two-way street. There are many mistakes that the media makes all the time. They misreport something, they don’t report something, they get a fact wrong. I don’t think that’s always -- you know, to turn around and say, okay, “You were intentionally lying”. I think we all try to do our best job, and do it with a degree of integrity in our respective industries. SPICER: Sure -- ask away, Jonathan. SPICER: We did, and at the time that was provided by the inaugural committee came from an outside agency that we reported on. And I think knowing what we know now, we can tell that WMATA numbers are different, but we were trying to provide numbers that we had been provided. That wasn’t like we made them up out of thin air. SPICER: Sure, it was the most watched inaugural. When you look at -- look, you look at just the one network alone got 16.9 million people online. Another couple of the networks there were tens of million people that watched that online. Never mind the audience that was here, the 31 million people watching it on television. Combine that with the tens of million of people that watched it online, on a device. It’s unquestionable. I -- I don’t -- and I don’t see any numbers that -- that dispute that when you add up attendance, viewership, total audience in terms(ph) of tablets, phones, on television. I’d love to see any information that proves that otherwise. SPICER: So, do -- do you dispute that? SPICER: Well, I do. I mean -- QUESTION: OK.
SPICER: I’m just saying, you’re asking me a question about my integrity. I have a right to say if you add up the network streaming numbers, Facebook, YouTube, all of the various live streaming that we have information on so far. I don’t think there’s any question it was -- that it was the largest watched inauguration, ever. QUESTION: More than Ronald Reagan’s in 1981? SPICER: I’m pretty sure that Reagan didn’t have YouTube, Facebook, or the internet. SPICER: Yes, I think 41 million people watched his. 41 million watched his. OK? So, let’s just take the Nielsen ratings, which are 31 million and add it to CNN, 16.9 million. That’s a little higher. So, I’m just saying, I’m not -- you’re asking me for numbers, there’s just two entities together. QUESTION: And -- and the -- the approach that you took on Saturday are(ph) there(ph) any second thoughts on that? QUESTION: (OFF-MIC) question, you know. SPICER: I think you guys might want to leave before I do. But look, I want to make sure that we have a healthy relationship. We saw the other day that -- and I’m not trying to rehash history, but you’re asking the question so I’m going to answer it. You know, we had a Tweet go out about Martin Luther King. Think about how racially charged that is. And someone rushes out and says to the entire press corps that the president of the United States has removed the bust from his office. Do you -- I mean, think about what the signal -- hold on, please. SPICER: No, no. He actually apologized to “my colleagues.” That’s the exact quote. OK? That quote, that report got Tweeted out around. And to report -- where was the apology to the president of the United States? Where was the apology to millions of people who read that and thought how racially insensitive that was? Where was that apology? QUESTION: You accepted his apology, though. SPICER: OK, I’m asking where was that apology? And so, I’m just saying that when you -- when things like that happen, when John Lewis says that he’s never missed an inauguration and we find out actually he did, under -- he skipped George W. Bush’s, that there are points in which we have a right to make sure that we correct the record. I mean, you’re talking about integrity and you’re talking about telling the truth and facts. I don’t know that it wasn’t malicious at all, and I’m not saying. But there is a point at which we have a right to go out there and correct the record. And I think that over and over again, there is this attempt to go after this president and say, well, that can’t be true and that’s not right and the numbers weren’t there. And there’s a rush to judgment every time. And it’s a two-way street. We want to have a healthy and open dialogue with the press corps and with the American people about what he’s doing to help this country and to unite it. But in a time when he’s trying to unite this and he keeps talking about uniting this nation, bringing this nation together, and then a Tweet goes out in a pool(ph) report to -- what? -- a few thousand people saying that he removed the bust of Martin Luther King, how do you think that goes over? QUESTION: Sean, did -- did the media invent the feud between the president and the intelligence community? SPICER: No, no. But I think there’s a difference between having differences with intelligence leaders and leaders of that community who we have strong differences with than the people and the men and women who toil every single day in our intelligence community. SPICER: And it was reflected at the CIA. I mean, they came there. They were so excited, there was 1,000 people that applied for 3,000 plus seats. And we ended up taking in 400 people. That doesn’t sound like a huge feud. They were excited, they were clapping, they were cheering when he walked in. And to see reports that made it sound like there was some, you know, fence mending that needed(ph) to happen, that sure didn’t look that way when you walked in. I’m going to move on. QUESTION: Sean, can I ask what is the U.S. strategic interest in moving the U.S. embassy from Tel Aviv to Jerusalem? And also, in the chat with President el-Sisi today, was the status of the Muslim Brotherhood discussed? SPICER: I think the readout -- I just gave you the readout on the call with President el-Sisi. I think that -- that speaks for itself what was discussed. And then -- I’m sorry, the first part? QUESTION: What is the U.S. strategic interest in moving the embassy from Tel Aviv to Jerusalem? SPICER: Well, I don’t -- as I noted yesterday through several press inquiries, we haven’t -- there’s no decisions. We’re at the very early stages of that decision-making process. QUESTION: John (inaudible) from BBC. Will there be a detailed discussion when Prime Minister May comes on Friday on the potential parameters of what have a trade deal might look like? Is there going to be a joint news conference? And is Donald Trump going to get a state (ph) visit back to the U.K. later in the year? SPICER: Well, look, we’re here on working day one. We’re excited that Prime Minister May is coming on Friday. We look forward to it. I’m sure that there will be a discussion of trade will come up, the degree to which I don’t know yet and I’m sure we’ll have an opportunity to brief you out. I don’t believe we have any plans right now for a joint press conference, but that’s something that our team will be working out with Prime Minister May and we’ll keep you updated on that. Yeah? QUESTION: (inaudible) news. After the executive order withdrawing the U.S. from the TPP, what specific steps will President Trump take to expand U.S. trade opportunities abroad? SPICER: Well, again, I -- I think when he talks to Prime Minister May, he’s gonna have a great conversation about the potential for greater trade with the U.K. I mentioned earlier when he met with these manufacturers this morning, that was, you know, right up there at the top of that list, how can we get greater market access? What are the specific challenges that these manufacturers are facing getting market access in the countries around the globe? And that’s an important issue. So it’s not -- it’s not just other countries, but within existing trade deals, we can figure out is there a trade dispute that can be settled with the WTO, is there a revision to one of the existing trade treaties that we have now? But there’s a lot that can be done. There are things that Congress can update to make sure that we’re importing and exporting more to benefit American businesses. QUESTION: Thanks. John Cruz (ph) from (inaudible). Has the president or will the president have a chat, even an informal chat, with the prime minister before, in fact, she comes here? SPICER: There are no plans for that now. It’s always possible. He’s been having a tremendous number of calls. I think the number is well over 80 now of people that have talked to him, congratulated him prior to being elected. He’s had a -- we read out the other day he’s met with both Canada and Mexico. I think he’s talked -- Prime Minister Netanyahu yesterday, President el-Sisi today. I think there’s -- there’s going to continue to be a robust number of world leaders. There’s a, you know, a tremendous excitement I think in the diplomatic corps and at the world leader level of people who are excited that President Trump and this administration want to engage. There is a lot of times when he’s talking to these folks and they’re saying, “I have not heard from anyone in years.” And I think that there is a genuine excitement to reengage the United States, especially in the area of trade and other economic interests, but also in the area of national security. QUESTION: I said needles to say, this is the big one, and it’s the first. QUESTION: TPP was dead on arrival (inaudible), so why this executive order anything more than symbolic? And when will President Trump start negotiating those bilateral deals with the 11 other countries in the Asia-Pacific? Could take some time and that could be, some would say, giving China, you know, room to make an inroad. SPICER: Well, first, I would argue that bilateral deals are mostly what China’s been engaging in, and that’s something that I just said that we’re gonna -- you know, the president’s gonna look to countries to engage with. QUESTION: (inaudible) 11 TPP countries? SPICER: Most of them we have existing trade agreements with -- or a good chunk of them, we have existing trade agreements to -- to being with. This was an expansion of that, and some in areas, it allowed, whether it was the service industry, financial services, additional market access. But I think that this is -- this is not a deal that was in our country’s best interest. The president could have come into office -- a president could have come into office and renegotiated it and sent people back to the drawing board. It hadn’t gone to Congress yet because it wasn’t finalized. I think this president pulling out of the agreement is not just about this one agreement, but I think it’s symbolic both here in America and around the world of a new era of trade policy, one that’s going to put American workers first and foremost and one that assures the rest of the world that the way that we negotiate bilateral agreements is going to ensure that we get something out of these deals. As I mentioned to John a minute ago, I mean, the problem with multilateral agreements is that often, we -- it becomes the lowest common denominator on so many things. And for the U.S. (inaudible) already has low tariffs and other service industry benefits for countries, you know, we’ve gotta be able to make sure we’re going out and fighting for the American worker. SPICER: We pulled out of TPP. SPICER: I’m -- I’m not gonna -- there -- we’ll have further updates on trade issues later this week, Jennifer (ph). SPICER: I -- I -- that’s a great question. I believe there’s an action that has to be taken under the -- the provision of NAFTA where you set -- you send notice to the other countries, the other two countries. The exact nature of how that’s described, I don’t -- but it is, there is a trigger within NAFTA, one of the sections allows the -- the president of the United States to notify them that we intend to do that. SPICER: OK hold on (inaudible). SPICER: Again, I think part of is it that he’s already spoken to both the president of Mexico and prime minister of Canada about his desire to -- to renegotiate. And I think as he meets with both of these individuals over the next 30 days or so, that’s gonna be a topic. Now, if they come in and -- and express a willingness to do that, you could negotiate it within the current parameters and update it through -- through the existing structure. If they don’t and he decided to -- to pull out, then we would have to go back to the drawing table in the future. SPICER: ...make sure Mara (ph) gets a question, this time. QUESTION: ...time (ph). Just to follow up on the China question. China actually has the regional agreement called the Regional Comprehensive Economics Partnership and now Japan and Australia, two of our great allies are talking about joining that. Does -- does the President Trump see a national security component to these trade deals and is he concerned that now China will write the rules for Asia-Pacific trade? SPICER: Well, I think he has been very, very clear about China’s place in the -- in the geopolitical landscape of economically and -- and national security wise. So he understands the need, that’s part of the reason that trade is important, bilateral trade. It provides a check on a lot of this. But again, I -- he’s always gonna be fighting for the interest of the country and the American worker. So where -- how we engage and with whom, is gonna be decided on whether or not we can get a deal that benefits our country, economically and in terms of national security. That there are there things that we can do economically, that actually end up also benefiting us from a national security standpoint because of the economic relationship that exists between the two countries. SPICER: OK. Mara (ph) gets a follow-up. SPICER: No you earned it. QUESTION: Thank you. Just really simple (ph), what is the average national unemployment rate? SPICER: I mean the Bureau of Labor Statistics puts (ph) it out. SPICER: Right, but I’m saying that -- so there’s a reason that we put out several versions of that. One is that it -- the illustrative nature of -- of how you count the unemployed, whether or not they’re long term unemployed or whether or not they’re still seeking a job. But there’s a reason that you put out several of these statistics, its so that economists can view them and decide, look at different landscapes on -- what -- on -- on how to -- how to make economic policy. QUESTION: ...on where we’re starting. SPICER: But -- but again, part of it is economic team is gonna look at a multitude of statistics and drive economic policies. His goal is obviously, to get as many Americans working together. That’s his ultimate goal. Is that when he sees people that are hurting, that haven’t had wages lifted up, that are unemployed, that can’t save for their kids future, that are having a trouble with their healthcare costs, that’s what he really cares about. It’s not just a number to him, it’s about -- it’s someone getting by, are their wages going up, can they find a better job, do they have access to education, whether its higher education, college or a VoTechnical -- a VoTech kind of school, so that they can train for the skills of the next century. Those are the kinds of things the president, he’s not focused on statistics as much as he is on whether or not the American people are doing better as a whole and whether or not a family. And it was interesting, I know when we talked about Carrier at one point, someone said well, that’s a thousand jobs. When you talk about those thousand jobs and their families, during the holiday season I would beg to differ that those people were unbelievably ecstatic that the president and the vice president intervened. And so every one of these meetings that you saw happen at Trump Tower and then now, its all about you know, whether it’s 2,000 or 20,000 jobs, that’s -- that’s the focus. It’s making sure that we have -- that small businesses have greater opportunity to be successful. That American workers can have their wages lifted up, that the benefits that they receive in terms of healthcare and education are something that -- that provide them the support that they need. But that’s what this is all about. That’s what he’s fighting for is that man or woman out there that’s doing everything they can right but can’t catch a break. And I think he addressed that in his inaugural speech when he talked about shifting power outside of Washington D.C. back to the American people because for too long it’s been about stats more (ph) and it’s been about, what number are we looking at as opposed to what face are we looking at? QUESTION: I have two questions. One on DAC - on DACA (ph), I was just curious about the message from this administration from the White House to young people who may qualify and not yet have their pension. Should they enroll going forward and those who are in the program now seek renewal? SPICER: Well, I think - yeah, what the - what those people should know is that the president’s laid out a list of priorities and the priorities are focused on making sure that people who can do harm or have done harm and have a criminal record are the focus. And as he said throughout the campaign, we’ve got a series of individuals who we’ve got to figure out. People who’ve overstayed their visas, people who have committed crime, and we’re going to go through that in a very systematic and methodical way. So for now, that’s not - the focus is going to be on people who have done harm to our country. QUESTION: 2016 was the hottest year on record and the last three years have been the hottest three years on record. Scientists are saying that we’re getting dangerously close to the point where human civilization is being threatened. How does President Trump plan to address this? SPICER: Well, I think - I think he’s going to meet with his team and figure out what policies are best for the environment but I think that there’s - one of the things that he talked about during the campaign is there’s a balance and he’s trying to make sure that we use our resources appropriately, that we maximize things to make sure that we don’t do so at the detriment of economic growth and job creation. So, there’s a balance and I don’t think it’s an either/or situation. We can ensure that we’re doing things that are smart for the environment and smart for our longevity as well as making sure that we’re doing things that create economic growth and job creation. QUESTION: What is the president’s message to the millions of people here in Washington and around the country who were protesting on Saturday? I have a follow-up after that. SPICER: OK. I have that’s (ph) very polite of you. I think he has a healthy respect for the first amendment and he - you know, this is what makes our country so beautiful, is that on one day you can inaugurate a president, on the next day, people can occupy the same space to protest something. But he’s also cognizant to the fact that a lot of these people were there to protest an issue of concern to them and not against anything. I remember this morning, Debbie Dingell was on television and she’s talking about - let me just, I don’t want to inaccurately quote her. I know Jonathan’s (ph) a stickler for that. QUESTION: ...How does he reach out to them (ph)? SPICER: I think he reaches out to them in a way that he started on the night that he won the election, on the way that he did on inauguration day by sending a message that talks about fighting for them. But more importantly, I think the president’s going to show through action and through success that he’s fighting for them and fighting for every American. One of the things that we’ve seen so often in this town is a lot of soaring rhetoric about how much people care. And I think the president is going to show through deed and action and success that he wants to fight for people’s healthcare, he wants to have a better education system, he wants a stronger America, he wants to go in and fix our inner cities, he wants to make sure that our infrastructure, our roads and our bridges. So, I think more than anything, showing people through action and deed and success is where he’s going to prove to the American people how much he cares to unite us and how much he cares to make this America better and safer. SPICER: ...I forgot, you did ask. QUESTION: I did, thank you for remembering. Another group - and this a follow-up on CBN’s question a moment ago, when we have the March for Life here in Washington, you’ve said that this is a pro-life president, what concrete promises is he making? We haven’t heard a lot about what that policy is going to look like. QUESTION: Yeah, but you’ve had a lot of time to make those promises. QUESTION: ...What should their expectations be? SPICER: Their expectation should be that he’s going to stand up and value life, born or unborn. Same as he said throughout the last year and half, that he’s going to stand up and protect life, promote it, and instill policies that promote life, that promote adoption, that help support young women, that help support funding of - of agencies and clinics that support women’s health. I think that’s what he’s going to talk about is supporting all of life, the born, the unborn, throughout life making sure that we have healthcare that can support the American people and the American families. That’s -- that’s what he’s gonna fight for and that’s what he’s gonna be clear on. QUESTION: (inaudible) first one, with the congressional meeting today and also at the retreat, you said talking about his legislative agenda. Besides healthcare, can you give us one, two or three legislative things that he wants to get through right away? So not the executive actions, legislation. SPICER: Right. Immigration’s obviously going to be high on that last. Tax reform, regulatory reform. That’s three and four. SPICER: Well, I think he’s gonna work with Congress to get the appropriations process going. But it’s not -- it’s not just building the wall. That’s through the appropriations process. It’s how do we enact policies to make sure that what we have now doesn’t happen again. And so it’s -- it is -- it is working with them. It’s a comprehensive look at how we’re keeping people out of this country that shouldn’t be here, that people who are coming to visit are leaving when they’re supposed to, to make sure that we’re tailoring immigration policies that make sure that we’re not an open door for anyone to just walk in, that the people who are here to visit our country safely or to come here to bring jobs or to support our economy are coming in. But I think he have to do immigration smartly, and that’s what he’s looking at. QUESTION: I had a second one. SPICER: I’m sorry. You’re right. QUESTION: I haven’t heard that you al -- you said or someone else has said specifically. Will the president -- has the president spoken to any of the intelligence agencies about the investigation into the Russian connections? And will he allow that to go on? SPICER: I don’t believe he has spoken to anyone specifically about that and I don’t know that -- he has not made any indication that he would stop an investigation of any sort. QUESTION: Clarification. You said you’re willing to work with anybody to defeat the Islamic State (inaudible). Does that include Bashar al-Assad? SPICER: Well, I think -- I think what it’s gonna -- what we’re doing -- we are going to smartly do this. I mean, let’s be clear. Part of it is to make sure that they have America’s interests in what they’re doing and who they are. So we’re not gonna get together with people under guise of defeating ISIS if that’s not truly their guise or if they’re not -- so let’s -- let’s not take that too far. Thank you. QUESTION: Sean, will the president release documents showing that he has left his businesses? SPICER: I believe we have. (UNKNOWN): They’re not public at this time. SPICER: But yeah, he has -- he has resigned from the company, as he said he would, before he took office. Don and Eric are fully in charge of the company. He has taken extraordinary steps to ensure that that’s happened. QUESTION: (inaudible) political priorities. What would be the message for the Hispanic commune in the U.S. taking into consideration that one of the priorities has been the wall? QUESTION: What would be the relation between this administration and the Hispanic community in the U.S.? SPICER: Well, I think his relationship with the Hispanic community is going to be great. I think he’s -- as I said, I think that whether it’s jobs or education or healthcare, the president is committed to uniting all Americans and working towards a better, safer, more secure, more prosperous America that benefits everybody. And I think whether -- regardless of your background, that’s something he is committed to. QUESTION: (inaudible) Financial Times. Does Mr. Trump agree with Rex Tillerson that the U.S. should try and prevent China from accessing the islands in the South China Sea where it’s building runways and other kinds of facilities? SPICER: I’m not gonna -- look, I think I answered the question. I think as we develop further, we’ll have more information on that. QUESTION: Thank you, Sean. Thank you, Sean. SPICER: Hold on, I’ll get to you. I promise. QUESTION: And welcome to your first day on the job. QUESTION: Very simply, there was an earlier question about Jerusalem and putting the U.S. embassy there and a lot of talk about executive orders. Is this something the president can accomplish by executive order? SPICER: It is, but I think as I noted, John, it’s very early in this process. We are at the beginning stages of this decision-making process and his team’s gonna continue to consult with stakeholders as we get there. QUESTION: ... and welcome here. QUESTION: So I have a follow-up on the housekeeping question about NAFTA. Are we not to expect, then, an executive order today to renegotiate NAFTA or will he wait until he meets with President Pena Nieto next week? And on the other -- the other question I had is, he didn’t mention Latin America at all in his -- you know, in his inauguration speech. Does he plan to visit Latin America this year? QUESTION: It’s not gonna happen today? SPICER: I think we’re done with executive orders for the day. But as I always say, stand by. But we do not have any intention to have additional executive orders today. But I believe there could be some additional ones throughout the week on trade. And we’ll have further updates for you on there. And then the second part? QUESTION: If he plans to travel to Latin America, given that he left them out of his inauguration speech? SPICER: Right. Well, I don’t think -- I don’t think he left them out. I think he was focused on this country, our -- our American workers. I don’t think he got into detail on any countries that I am aware of or that I can recall. But I also think we are here on the first working day. We’re announcing Theresa May coming this Friday. We’re excited to have the prime minister here. As I said, we already talking about setting up a meeting with Canada and Mexico. He’s talked to Prime Minister Netanyahu about having him come over. And then as I mentioned, President el-Sisi. So, we’ll get there. We -- we got a lot of calls to return. There’s a lot of excitement through the world. And a lot of people who are really excited, both to come here, and have the president visit them. QUESTION: Sir, last week on LGBT rights. The long time Republicans (inaudible) group delivered a white paper to the Trump team, urging the president to maintain an executive order from President Obama, borrowing anti-LGBT worker discrimination among federal contractors. SPICER: Yeah, I -- I don’t know on that one. As I -- I’ll have to get back to you on that one. I don’t know that we’ve gotten that far on the list of executive orders, but I’ll be glad to get back to you. SPICER: What’s that? Again, it’s not -- I just don’t know the answer. I’ll try to get back to you on that one. QUESTION: On immigration, the chief of staff -- I think, it said over the weekend, seemed to suggest that an executive order shutting down the DACA program had been ruled out. Is that officially ruled out as you guys go forward? And does the -- does the president support action in Congress that would, essentially permanently establish those protections for those. SPICER: Yeah, I think -- I don’t have anything further on the executive action front. But what I -- I think I’ve asked and answered the -- the DACA piece to this, in terms of his priorities right now. SPICER: I -- I think that we’ll have to -- we don’t have anything in front of us right now to sign on. So give us a little bit of time, we’ll see what Congress moves forward with, and then I’m sure we’ll have a further read out on both, the executive order piece and on the legislation. SPICER: I don’t know. I’ll -- I’ll have to get back to you on that one right now. Or -- I think the best thing to do, would probably contact the Department of State. Yes, sir in the back? SPICER: Well, look, I don’t -- I think, he’s gonna increase market access wherever he can. He’s in the process of reviewing all of our current trade agreements. And looking at potential bilateral options going forward, whether it’s in the E.U., or in the Asia- Pacific arena, or in the Middle East. He’s gonna figure out where we can expand U.S. market access. And that’s I think, what today’s decision really starts to show. Is that it’s not about multilateral agreements under a Trump administration. It’s about bilateral agreements, where we can figure out country to country, how can we fight for the American worker, gain them access to another market that’s gonna benefit our large and small businesses who want to sell additional goods and services. QUESTION: Why did the president choose the British prime minister as the first foreign leader for him to meet? And can we take from that that he intends to make the relationship even closer? SPICER: I think we’ve always had that special relationship with Britain. And -- and he’s gonna -- and that reflects in -- in his first visits -- the prime minister’s first visit here. He’s had a great conversation with her and he looks forward to having her here. But we can always be closer. SPICER: What’s the last part, please? SPICER: Well, I -- I think, on China, he understand what a big market that is for U.S. goods and services. When he met with the head of Alibaba a couple of weeks, that -- that was part of the point. There’s huge market issue there. But in many cases, it’s -- it’s not a two-way street. There are so many Chinese businesses and individuals frankly, who can have ease of access in the United States to sell their goods or services. I think that whether or not you’re talking about the financial services or the banking, you know, the other service industries, or our manufacturing goods and services, or some of the IP problems that we have with China, that it really is not a two way street. And so he understands the market that China has and our desire to further penetrate that market. But he also recognizes, there’s a lot of concerns with how we are treated entering into China’s market, and we need to review that. Yes Ma’am? I think we’re going to have further -- a lot further updates on that. Yes Ma’am? QUESTION: Welcome. Question following on what she was asking about the TPP. You know, part of the thinking of TPP was to encircle China economically and I wonder if the President has thought a little bit about what kind of bilateral relationships in the region -- trade relationships would accomplish a similar goal, and secondly, I heard you talking about NAFTA and a trigger, but I didn’t hear you say you had triggered the trigger. SPICER: We have not triggered the trigger, hasn’t happened. But again I think we have an existing relationships with many of the countries that were part of the 12 nation make up of TPP. And I think we’re going to continue to explore how we can -- in some cases strengthen those relationships or look for bilateral agreements with nations that we didn’t have one through TPP. QUESTION: Social security and infrastructure. On social security, the President will be meeting tonight with congressional leaders. What’s he going to do given his campaign promise on not touching social security when Paul Ryan and Mitch McConnell send him a bill that declaims (ph) in a funding package various cuts in social security. And on infrastructure, has it fallen off the radar screen, or is it going to be -- stay a priority for the President? SPICER: So on social security, he’s going to have to talk to them, I think he’s been very clear with his priority is in terms of preserving and protecting this really important benefit to our seniors. He understands -- I mean, the -- Mr. Trump’s employed so many people over the years, he understands the struggle that people have later in life to continue to make ends meet and I think that he is keenly aware of how important this program is to so many people in their later years. And so he’s going to continue to fight to make sure that that’s a program that is preserved and protected. SPICER: Infrastructure, of course, yes. That’s definitely -- and he’s continued to bring that up. He talked with the business executives today about how so many of our airports, that are so important to our commerce system, getting planes to land in and out, roads and their ability to truck things across the country, even our freight system. That if our infrastructure is not strong, it inhibits our ability to have free commerce, it inhibits -- it drives up the cost of goods and services, when someone’s got to take a different route. Or is limited in the opportunities that they have because their runway might be closed or it can’t be expanded or a rail line breaks down. Or highways just not -- the wear and tear it puts on trucks or shut down. So infrastructure continues to be huge priority for him. Yes Sir? QUESTION: Two questions, the National Security Council -- sacking (ph) of the National Security Council, when do you expect to have that -- those positions filled? SPICER: We’ve gotten many of them filled. SPICER: I’d have to get back to you on the number but it’s actually fairly robust right now. There are a lot of hold over’s, but General Flynn has been working diligently with K.T. McFarland -- his deputy and others to make sure that that’s filled out and ready to go. He’s had countless meetings with counterparts and had several folks detailed over. But it’s a very very robust efforts from day one. QUESTION: And follow up to Don Carls (ph) question. So are you retracting your claim on Saturday that it was the largest crowd in person for the inauguration? SPICER: That’s not what I said. QUESTION: Well you said it -- this was the largest audience to ever witness an inauguration period. Both in person and around the globe. QUESTION: Both in person and around the globe... SPICER: ... And around the globe. Yes. In total audience it was. QUESTION: In total audience, but not simply in person. SPICER: But that’s right, but again I didn’t say in person. Both in person and around the globe, to witness it. QUESTION: You’re saying those together? SPICER: No, that’s actually what I said. It’s not what -- I don’t know how you can interpret it differently. That’s literally what I said. To witness it in person and around the globe. Total audience yes. QUESTION: But not for in person? SPICER: I am not. I am saying that it was the total largest audience witnessed in person and around the globe. QUESTION: (Inaudible) go back to one publisher (ph) (inaudible). Those with knowledge of who was in the room in the lobby of the CIA that senior leadership were not among those hooting and hollering and that were some 40 people who were in the first front rows who were brought in by Trump and Pence and Pompeo. I’d like to give you a chance to respond to that recording. SPICER: I don’t think that’s accurate at all. In fact I think if you list to the audio of it, you can hear the excitement that exists there. There were some people that had to be off camera for obvious reasons, but I think when you look at the number of people that were there, the audio alone tells -- tell -- you know, speaks volumes to what had happened. I don’t -- I don’t think that there’s any question about that. QUESTION: So the people in the -- the front who were seen on camera, those were CIA employees? SPICER: Honestly, I don’t have a seating chart. I think we had a very small footprint going over there. I don’t know who exactly went over. But, I don’t -- I don’t know, maybe 10 people, at most. Sarah was there(ph). SPICER: 10 were in our -- were in the travel going over. So, 10 out of 400, plus. QUESTION: But the people -- the people who(ph) were(ph) in the front row, so those were CIA employees? QUESTION: Some of them were not? SPICER: I’m sure we seated -- I don’t -- I can’t say -- I’m not really sure why this matters. I mean, 10 people didn’t yell that loud. SPICER: I -- I -- I -- all I can do is tell you to listen to the tape alone. I think you can hear a lot of that. Yes? QUESTION: A couple questions that I’ve(ph) been down here for awhile. Has the president formerly requested or received Pentagon advice on how he could change the campaign against the Islamic State? SPICER: I think he has ordered it. He’s going to -- as I mentioned, he’ll be at the Department of Defense on Friday to swear in General Mattis as his next secretary -- well, to, you know, go through the ceremony of that. He is obviously the Secretary of Defense. And so, you know, at that time he will continue to have conversations about what he wants from -- from them and the Joint Chiefs. Shannon(ph)? QUESTION: Just a follow up. QUESTION: I don’t -- I don’t mean to beat a dead horse on the issue of the U.S. Embassy in Israel. QUESTION: But, can you -- at the end of the president’s first four years, assume(ph) he’s -- you know, at the end of the next four years, will the United States embassy be in Jerusalem? SPICER: Well, I -- I think I’ve answered it twice now. I -- we are at the early stages in this decision making process. QUESTION: But it’s not whether, it’s when and how? SPICER: I -- I -- there’s a reason you go through a decision making process. And that’s what we’re in the process of starting right now. So, I just don’t want to get ahead of -- it would -- if it was already a decision, then we wouldn’t be going through a process. SPICER: OK, I just answered the -- thanks, Julie. Jim? QUESTION: First of all, congratulations and thanks for taking my question. Getting back to Saturday at the CIA and your statement here at the podium. Why make this crowd side issue -- or crowd size issue something to talk about at all? I mean, why get into it? Did it bother the president that much that he felt that you needed to come out here and straighten that out for us? And why did he choose the CIA as the venue to talk about that? SPICER: So, two things. One, I just got handed a note. All of the people -- no one in the front row was Trump. They were all CIA. SPICER: That’s what you asked. QUESTION: I said the first three rows. SPICER: OK. I’ll find out who the other two were. (LAUGHTER) I’m sorry, I just got you the front row, give me a second, I’ll get the second and the third. Do you want to get to the fourth and fifth, or -- OK, let me see what I can do. Look, I think that one of the things that happened, Jim, was he kept hearing about this rift that existed. He talked about it a couple of weeks ago at his briefing about how proud he is and how much he respects the intelligence community. And I think when he walked into that and he saw it, he wanted to make sure that people knew that what you’re hearing on television or in reports about this rift -- I -- I have the utmost respect for you, I honor your service, I’m proud of what you’re doing and the sacrifices that you’re making. And I think that he wanted them to know that you see and hear all of this stuff on T.V. about this rift that so-called exists and clearly it doesn’t matter; like, don’t believe what you’re hearing, know that I -- I -- I have a tremendous amount of respect for you, I appreciate everything that you are doing. SPICER: No, I’m not going to get into conversations that I have with the president. But I will tell you that it’s not -- it’s not just about a crowd size. It’s about this constant -- you know, he’s not going to run. Then if he runs, he’s going to drop out. Then if he runs, he can’t win, there’s no way he can win Pennsylvania, there’s no way he can win Michigan. SPICER: Then, if won, it’s oh, well he(ph) -- there is this constant theme to undercut the enormous support that he has. And I think that it’s just unbelievably frustrating when you’re continually told it’s not big enough, it’s not good enough, you can’t win. SPICER: Hold on -- because I -- I think it’s important. He’s gone out there and defied the odds over and over and over again. And he keeps getting told what he can’t do by this narrative that’s out there. And he exceeds it every single time. And I think there’s an overall frustration when you -- when you turn on the television over and over again and get told that there’s this narrative that you didn’t win. You weren’t going to run. You can’t pick up this state. That’s not -- you know, that’s a fool’s errand to go to Pennsylvania. Why is he in Michigan? How silly, they’ll never vote for a him. A Republican hasn’t won that state since ‘88. And then he goes and he does it and then what’s the next narrative? Well, it must have been because of this. He didn’t win that. And then people aren’t attending anything or John Lewis is the first person to skip his inauguration. Not true. And over and over again, the MLK bust. I think over and over again there’s this constant attempt to undermine his credibility and the movement that he represents. And it’s frustrating for not just him, but I think so many of us that are trying to work to get this message out. And so I mentioned this to John, part of this is a two- way street. We want to have a healthy dialogue, not just with you but the American people because he’s fighting for jobs, he’s fighting to make this country safer. But when you’re constantly getting told that can’t be true, we doubt that you can do this, this won’t happen, and that’s the narrative when you turn on television every single day, it’s a little frustrating. And I think that for those people around him, his senior team especially, but so many of the other folks that are either here in the administration, that gave up their time during the transition, they left a job to work for three or four weeks because they are so committed to having his nominees get through, it’s a little demoralizing to turn on the TV day after day and hear, can’t do this, this guy’s not going to get confirmed, not way they’re going to go through. QUESTION: ... in D.C., that comes from being president of the United States and working at the White House? SPICER: No. No, look, I’ve been doing this a long time, you’ve been doing this too. I’ve never seen it like this, Jim, I’ve never -- and again, I’m not looking to go back and forth, but you’re asking for an explanation. And I think that it’s important to understand, that whether it’s the president himself, the vice president, the senior team, the volunteers or the people who are out there just in America that voted for him or walked the streets or put up a sign, that to constantly be told no, no, no and watch him go yes, yes, yes every time and to come up to the next hurdle and see someone put a block up gets a little frustrating. And I think that we are -- and so, you see this historic thing. And he stands there at the Capitol and I was not that close but, you know, on the platform, and you look out and all your -- it’s an amazing view. And it’s just so many people who got in long lines, who had to go around all this different stuff to get in. And that was for the first time that we did have to go through fencing that far out. And then to hear, “Well, look at this shot,” and it’s not -- “It wasn’t that big.” It’s a little demoralizing because when you’re sitting there and you’re looking out and you’re in awe of just how awesome that view is and how many people are there and you go back and you turn on the television and you see shots of comparing this and that. And then you look at the stuff that’s happening. QUESTION: Isn’t it a fair criticism that you’ve got bigger fish to fry? Why worry about a couple of tweets about crowd size? The narrative -- and the default narrative is always negative and it’s demoralizing. And I think that when you sit here and you realize the sacrifice the guy made, leaving a very, very successful business because he really cares about this country and he wants -- despite your partisan differences, he cares about making this country better for everybody. He wants to make it safer for everybody. And so when you wake up everyday and that’s what you’re seeing over and over again and you’re not seeing stories about the Cabinet folks that he’s appointing or the success that he’s having trying to keep American jobs here. Yes, it is a little disappointing. QUESTION: It’s not always going to be positive. SPICER: No, it’s not, and sometimes we’ll make mistakes. I promise you that. But it’s not always got to be negative, Jim. Some days, we do do the right thing. Some days we are successful. So it’s not -- part of us is saying, when we’re right, say we’re right. When we’re wrong, say we’re wrong. But it’s not always wrong and negative. There are things -- there’s a lot of things that he’s done already, a lot of amazing people that he’s appointed, a lot of success that he’s having. And it would be once -- nice once in a while for someone just to say -- report it straight up, he appointed this person, here’s their background. Not why they’re not gonna get nominated, not why it’s not gonna happen. SPICER: Hold on. One last thing. Hold on. I can’t -- I know we’re getting really into like facts. So just to be clear, there were no Trump or White House folks sitting down. They were all CIA (inaudible). So not in rows one through anything, from what I’m told. I appreciate Julie’s effort, but I want to -- I’ve Hallie (ph). John, you got one. Give me a second. QUESTION: So, Sean, a couple -- a couple of questions here, if you don’t mind. First one on Russia. The administration was asked about multiple interactions between National Security Adviser Mike Flynn and a Russian ambassador. I believe you at the time -- the administration at that time said it’s -- the calls were related to setting up a discussion later between President Trump and Vladimir Putin. QUESTION: Were those conversations about anything else other than setting up that discussion? And why has that discussion not yet happened between the president and President Putin? SPICER: So there’s been one call. I talked to General Flynn about this again last night. One call, talked about four subjects. One was the loss of life that occurred in the plane crash that took their military choir, two was Christmas and holiday greetings, three was to -- to talk about a conference in Syria on ISIS and four was to set up a -- to talk about after the inauguration setting up a call between President Putin and President Trump. That -- I don’t believe that that has been set up yet because the call was to say -- they did follow up, I’m sorry, two days ago about how to facilitate that call once again. So there have been a total of two calls with the ambassador and General Flynn. And the second call came -- I think it’s now three days ago -- that was to say once he gets into office, can we set up that call? It hasn’t -- to my knowledge, has not occurred yet. QUESTION: Any other conversations between General Flynn and Russian members of the government? SPICER: Not that I’m aware of. And when I say that, what I’m saying is during the transition, I asked General Flynn that -- whether or not there were any other conversations beyond the ambassador and he said no. QUESTION: ... on a statement that the president made on Saturday. Can you -- and I just want to clarify your answer here. QUESTION: Can you unequivocally state that this administration will not send more troops into Iraq to, as the president has put it, take the oil? SPICER: I’m not gonna talk about what we may or may not do. I think the president’s been very clear that he doesn’t telegraph forward what -- taking options off the table. That’s not a good negotiation skill. That’s not how he works. There’s a reason he’s been successful at negotiating, is because he does it in a way that doesn’t telegraph to people what he’s gonna take on or off the table. QUESTION: Narrowing down his nominees, I should say. QUESTION: And at the end of the Obama administration, the number of prisoners in Guantanamo Bay was reduced to about 40. QUESTION: What are the president’s plans for that prison? SPICER: So on the first, I -- I think that in the next week or so, we should have an update on a nominee for the Supreme Court. SPICER: It does. I think we will have a nomination within the next couple weeks. He continues to make that a priority of his. On Gitmo, I think you’re gonna see further action. I don’t want to get ahead of the president, but this is something that has been discussed and has -- it is in his current decision-making process how he wants to handle that. QUESTION: If I could just ask one more. You said that the president disagreed with the characterization of a rift with the intelligence community? QUESTION: Do you dispute, though, his tweet about comparing the intelligence community to Nazi Germany? SPICER: I -- no. I think what he was talking about was the process, not the people, and that’s a very different thing. QUESTION: (inaudible) three months ago then candidate Trump was in Gettysburg and he made a list of Day One promises. He called it a contract with the American voters. A bunch of them are not gonna get done today because you said he’s done with making executive orders; labeling China a currency manipulator and posing congressional term limits (inaudible). I wanted to ask you why not pursue all those on day one, as he promised in a contract with the voters? SPICER: Well, I think he is -- we’re going to continue to sequence those out. I mean, part of it is to make sure that we don’t spend our entire day signing executive orders and (inaudible). There’s a way that we can do this to make sure that we’re getting all of those things that he promised the American people done in short haste and doing it in a way that doesn’t just jam them out in a fire hose. QUESTION: He still plans to (inaudible) that Day One list, though? SPICER: That’s his intention, yes. He’s very clear about that. QUESTION: Is the president going to shake up the leadership of CFPB before the director’s term’s up? SPICER: I’m not going to - no decision has been made at this time on that. SPICER: There’s - he discussed on the phone with both leaders his desire to reform it but obviously his goal was to have that discussion when they come in person and I think I mentioned yesterday the foreign minister of Mexico’s going to come on the 25th, 26th to sort of set the table and have some of those meetings ahead of President Pena Nieto’s meeting here. SPICER: ...Well again, he’s been - this is his first working day. I think it’s been pretty busy and robust not just today but in the 2 1/2 other days that we had. And I think you’re going to see a lot more come - come out but, you know, there’s a lot of things that have to get done and a lot of things that we’re working on as a staff to get him prepared. He’s going to continue to have very, very robust weeks. Thank you, guys. I appreciate it. This was a good first one. SPICER: Go ahead. QUESTION: First of all, congratulations. QUESTION: And also, there has been (inaudible) ...community. My question is around the last two days I have gone to a number of balls - nation balls (ph) including the nation and India (ph) American ball (ph). And most of those people were supporting President Modi’s (ph) actions and also creating (ph). But most important, across the street from U.S.-India business council, most gain again (ph), he represents 500 Fortune companies to and from India. ...His companies are supporting (ph) so my question is where do we go as per U.S.-India and U.S.-Asia - U.S.-India restoration projects (ph)? SPICER: Well, look, thank you for the question. I think that whether it’s India or other countries throughout the globe, today as I mentioned, I mean the goal is to figure out countries and markets that we want to access that benefit the American worker, help us grow manufacturing, the services industry, and so that’s one area that we’ll continue to work with the prime minister there on. But we’ve got a very robust agenda. Thank you, guys, it’s been a pleasure. God bless, see you tomorrow.